$10,000 Bonus to Buyers Agent Upon Closing! 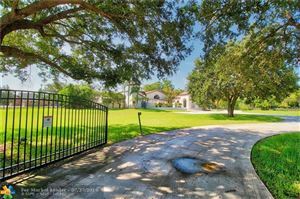 The Setting for this Breathtaking Estate is the Most Beautiful Golf Course & Waterfront Lot In Parkland! Gorgeous Wide & Long Views of the Golf Course & Water can be Seen From Most Rooms in this Turn Key Home. Offerings: Media Room/Stately Curb Appeal/Freshly Painted Exterior/Walls of Windows & Glass Doors/Polished Light Marble Flooring/Impressive Architectural Details/Soaring Ceilings/Grand Staircase/Luxurious Master Suite with Sitting Area, Spa Like Bathroom & Morning Bar/Impressive Foyer/ Island Kitchen with Fine Cabinetry,Top of the Line Appliances, Butler's Pantry, Granite & Marble. 5 Star Resort Style Pool with Spa/Full Summer Kitchen/Alluring Outdoor Living Areas/Manicured Landscape. It's Beauty & Captivating Views Cannot be Duplicated. Magnificent Luxury Estate, Impeccable and Professionally Designed, has every Luxury upgrades imaginable!! A grand two -story foyer with a circular staircase leads to an inviting living room and dining room with a coffered ceiling. Outstanding 6 Bedrooms, Plus Office and Game Room (loft). Expanded Master Bedroom suite with 2 large walk in closets and a luxurious master bath, Roman tub, double showers, his and hers vanities.. Exquisite views throughout from the Golf Course and a peaceful lake. This Marvelous Home sits on one of the best locations in PGCC, with the most gorgeous landscaping and the finest upgrades! 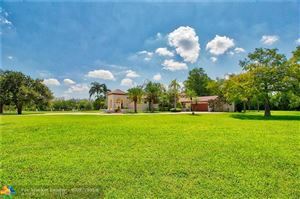 CONTEMPORARY 5BED 5FULL BATHS,2 HALF BATHS+THEATER+CHILDRENS GAME RM+LIBRARY+LOFT ON WIDE PANORAMIC 150 ACRE LAKE. IMPACT WINDOWS &DOORS.36X36 PORCELAIN FLOORS IN ALL LVG AREAS. DRAMATIC DOUBLE STAIRCASE WITH 24' VOLUME CEILINGS,CROWN MOLDING IN ALL SOCIAL AREAS. GOURMET CHEFS KIT WITH 48" WOLF GAS COOK TOP& WOLF DOUBLE OVENS.SUBZERO 48"REFRIGERATOR,VIKING HOOD,WHOLE HOUSE WATER FILTRATION,OVERSIZED KITCHEN ISLAND,2 WALK IN PANTRIES &BUTLERS PANTRY.MASTER BATH WITH CONTEMORARY PORCELAIN TILE,RAINHEAD &BENCH IN SHOWER& FRAMLESS ENCLOSURE.M BED EXPANDED WITH SITTING AREA.THEATER WITH SEATING FOR 9 & 148" SCREEN, CHILDRENS GAME/PLAY RM.COVERED BALCONY &PATIO WITH PHANTOM SCREENS,EXTENDED MARBLE PAVERS IN PATIO WITH PERGOLA FOR ENTERTAINING.BUILT IN SUMMER KITCHEN GRILL WITH NATURAL GAS& SINK. FURNISHED Spectacular Golf & Lakefront Estate w/breathtaking VIEWS*All Impact Windows/Doors*Just re-landscaped*Painted*Landscape lighting Front/Rear*Stunning French Pattern Jerusalem Stone Floors w/chiseled edges*Coffered ceilings*Crown*Island Kitchen w/2 DW's+Pot Filler+Built-in Miele Esp/Coffee Maker*Butler's Pantry*Designer Window Treatments, Lights & Fans*First Floor In-Law Suite w/private entry*Media Rm/6th Bdrm*2ND FLOOR: Brazilian Cherry hardwood floors*Master Suite w/lounge & Morning Bar, Master Bath w/2 WCs, Bidet, Spa Tub*2 Huge W/In Closets*Enormous Master Bedroom w/Balcony*Office/7th Bdrm shares bath w/Bedroom #2/has balcony, Bedrooms 3 & 4 have private baths*PLEASE CLICK ON "VIRTUAL TOUR" to virtually walk through this magnificent estate home! Highly Upgraded Treanna Model. 6 bedrooms,loft and office, 4.5 bathroom home on Oversized Lake Lot with Pool. Double door entry with wood floors, Brickfront gas fireplace, Custom Kitchen with large Quartz center island and top of the line appliances, Sub Zero fridge, Wolf Double oven, Wine Cooler, Marble Counters and Gas Cooktop. Insta Hot Faucet. Premium Insulation and 95% LED Bulbs. Nest Smart Home,2 Cameras 14 Smoke/Carb mon detectors and 3 Thermostats. RE-Circulating hot water thruout. Lighting from Restoration Hardware. Gorgeous backyard with concrete patio. Pool with Spa has Glass Kiddy Fence, Shallow area w/Umbrella slot and 2 Bubblers, Salt System, LED Lights, Oversized Heater, all controlled from app and built in benches with fire pit. Impact glass throughout. CUSTOM BUILT 6 BEDROOM 4.5 BATHROOM HOME W/EVERY UPGRADE IMAGINABLE. SPECTACULAR VIEW OF THE LAKE & GOLF COURSE. FEATURES INCLUDE INFINITY POOL, CHEF'S KITCHEN W/TOP OF THE LINE APPLIANCES, GRAND FOYER, 2 STAIRCASES, MEDIA ROOM, MARBLE & WOOD FLOORS W/NATURAL LIGHT THROUGHOUT! THIS HOME IS LOCATED ON AN OVERSZED LOT. ABSOLUTELY STUNNING MEDITERREAN STYLE HOME WITH SPACIOUS OPEN COURTYARD AND POOL. OVER SIX HUNDRED THOUSAND DOLLARS IN RECENT RENOVATIONS. NEW 800 SF KITCHEN ADDITION BOASTS BEAUTIFUL CHANDELIERS, MARBLE COUNTER TOPS, AND ALL TOP OF THE LINE STAINLESS STEEL APPLIANCES. OTHER FEATURES INCLUDE: MARBLE FLOORS, GUEST POOL HOME, INDOOR SAUNA, HEATED SWIMMING POOL, IMPACT GLASS WINDOWS, OUTDOOR BAR, INDOOR BUTLER BAR, TOO MUCH TO LIST. COME. SEE. MAKE THIS HOME-YOUR HOME. YOU WON'T REGRET IT. An amazing private estate home with second house located on the property. An ideal layout for generating income and business opportunities such as Dentist chairs. Second house can also serve many purposes including hall, business center, in laws quarters, and so much more. The estate has amazing wide open spaces, pool and spa, and all the privacy your client could ask for. Space to build, store boats or RVs, or play host to events.